The Adam and Gila Milstein Family Foundation is proud to partner with Students Supporting Israel (SSI) and Hasbara Fellowships, both pro-Israel campus movements. A participant in these programs, Liat Menna, shares how the Milstein Family Foundation’s support has helped her find a truly strong and rewarding connection to Israel. You can read her post below. The most rewarding part of advocacy on campus is belonging to a supportive community — a unique group of people who share so much passion and love, who seek truth with a genuine effort to heal the world from bigotry and hate, and who simultaneously celebrate the great diversity, rich culture, and beautiful faith that the Jewish people share. The Adam and Gila Milstein Family Foundation (MFF) has been one of the key contributors to this reality. The Foundation has supported countless individuals and groups in an effort to strengthen the Jewish community and homeland. The MFF has worked with Students Supporting Israel (SSI) and enabled Zionist students across college campuses to speak in a united voice in support of Israel, while also educating their respective communities. SSI’s 480% growth in three years is a testament to its need and success. Yet this would not be possible without the partnership of other community organizations, particularly the MFF. Within the past year, the Foundation has helped tremendously with many SSI programs at the University of California, Los Angeles (UCLA). One example of positive programming that the Foundation supported was Peace of Art, a program hosted in October 2015 by SSI at UCLA and SSI at the University of California, Santa Barbara (UCSB). For the event, the pro-Israel group Artists for Israel joined together with SSI to offer a message of peace and understanding on campus. Art, as an international language and healer, connected Jews and non-Jews, and Zionists and non-Zionists, as well as apolitical attendees. The program was a huge success, reaching many diverse students throughout both campuses. Peace of Art is a nationwide campaign, which continues to create bridges and succeed on other campuses across the United States. The Foundation has also supported programs to empower campus Zionists, such as trips to the AIPAC Policy Conference in Washington, D.C. The MFF sent a group of UCLA delegates to the conference this past March as Milstein Scholars, in partnership with Hasbara Fellowships. It goes without saying that the MFF invests in the future and realizes the potential of students on campus to become the next leaders. Going to the policy conference allows students to learn about so many issues related to Israel and its relationship to the U.S. It allows students to learn, and think of where change is needed and where their effort and work is critical. The policy conference is truly rewarding for the students who attend—they leave with a strong sense of community, having witnessed 18,000 Zionists come together, and with greater passion to contribute to a strong relationship between the U.S. and Israel. The Zionist community is so lucky to have dedicated and passionate supporters like the MFF. The Foundation empowers us as individuals to each make a small difference—and together to make transformational change. To learn more about the philanthropic work of Adam Milstein and the Milstein Family Foundation, visit http://milsteinff.org. Also – check out Adam Milstein and the Milstein Family Foundation on Facebook! Hadas Sella is the Executive Director at the Adam and Gila Milstein Family Foundation. Born and raised in Israel, Hadas has a dual degree in Law and Economics from the Tel Aviv University, and is a certified attorney in Israel. After working for a top-5 law firm in Jerusalem and then as a Tax Attorney at Ernst & Young in Tel Aviv, she moved to Los Angeles in 2012 and in June 2014 graduated from the UCLA Anderson MBA program. 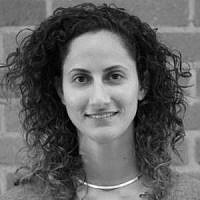 After graduation, Hadas was recruited to the Milstein Family Foundation as a Program Director. In her role, Hadas oversees the foundation's activities, donations, grants and operations.